An item that is useless although it may be valuable is referred to as a white elephant. The idiom derives from an old story about a king of Siam (present-day Thailand) who gave a white elephant as a gift to a courtier he did not like. The hapless courtier would not dare dispose of the animal, even though the cost of maintaining it was such that it eventually drove him to financial ruin. The term is applied derisively to certain public facilities and nuclear power plants. And white elephants invariably accompany an Olympic Games. It is never easy for host cities to make full use of their Olympic facilities after the roughly month-long sporting extravaganza ends. In Athens, the host of the 2004 Olympics, an arena is reportedly sitting idle, overgrown with weeds. Probably because many cities are afraid of getting stuck with white elephants, those that were initially considering bidding for the 2024 Summer Games have since withdrawn, leaving only Paris and Los Angeles in the race. As for the Games beyond 2024, there is no telling how many cities, if any, will raise their hands. Given this "drought," the International Olympic Committee apparently believes that it cannot afford to reject either of these two bidders for the 2024 Games, and is moving toward awarding the 2024 Games to one and the 2028 Games to the other. The IOC calls for "inexpensive" Olympics, but that's definitely easier said than done. We in Japan have witnessed the costs of the 2020 Tokyo Games, initially projected at 800 billion yen ($7.07 billion), snowball to nearly 2 trillion yen at one time. Perhaps the time has come to consider ending the convention of letting different cities take turns hosting the Games. For instance, how about holding every Olympiad in Athens, the birthplace of the ancient Olympics? This should prevent any more white elephants from being born. Some may worry that such a fixed-venue formula will take the fun and excitement out of the Olympics. 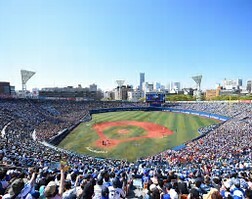 But Japan's high school baseball and rugby championships each having a permanent "sacred" venue--Koshien Stadium for the former and Hanazono Rugby Stadium for the latter--and this enhances the excitement and special nature of the events held there. Seen in this light, I don't think it is particularly unreasonable to establish a "holy land" for the Olympic Games.